Hey! guess what? I still don't like sorbet! I'm just an old fashioned milk and sugar kinda guy. I just don't get sorbet. I just don't find it pleasant. It's not as sweet and creamy as ice cream, yet somehow less enjoyable than a frozen ice type treat. 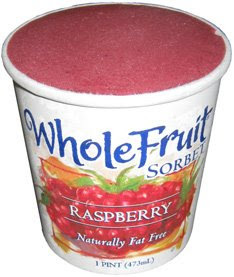 I assume this is quality sorbet, though who knows since I'm not sure I've ever seen generic sorbet. At least the container was sealed to keep it nice and fresh. I'm half tempted to try and turn this into a smoothie or shake type project (maybe mix it with milk and some Turkey Hill Cold Churned Raspberry). Couldn't hurt, especially since I know I won't eat it otherwise. Oh well. Update: I tried the "milkshake" idea ...it didn't work. Oh well.